Lucius Walker of Pastors for Peace was in the front row at the July 26 speech. 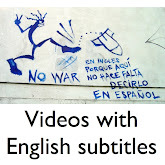 He exchanged a few words with Raul Castro through a translator. I have no idea what they were talking about, but they smiled and laughed at times and appeared to be enjoying themselves. 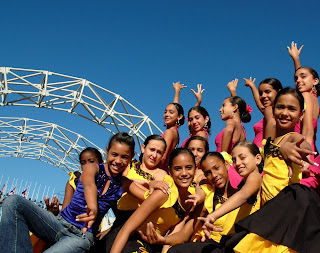 July 26 sign: "We're happy here"
HOLGUIN, Cuba - Only sweat and hard work, and not revolutionary slogans, will lift Cuba from grinding economic times, President Raul Castro said on July 26, the 56th anniversary of the start of the Cuban revolution. Planting crops on idle farm land is especially urgent, he told tens of thousands of countrymen. 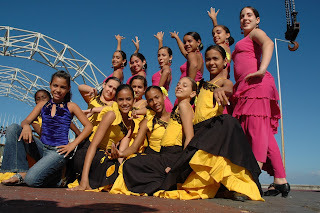 July 26 commemorates a daring rebel attack on the Moncada barracks in Santiago de Cuba, the country‘s second-largest city. 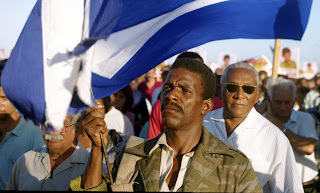 The 1953 attack was a failure, but it launched the Cuban revolution that forced Fulgencio Batista from power in 1959. More than a half century later, Cuba is reeling from economic troubles and a string of hurricanes that caused more than $10 billion in damage in 2008. Even before the storms, many Cubans say they were having trouble putting food on the table. More than half the country’s farm land is idle, much of it overrun with an invasive plant known as marabu. Officials are giving away land with hopes of boosting agricultural production. “It’s a question of national security to produce the crops that grow in this country and which we spend hundreds of millions of dollars - and I‘m not exaggerating - to bring from other countries,” Raul Castro said. Fidel Castro presided over the July 26 anniversary in 2006, but fell ill days later and underwent emergency intestinal surgery. He later announced he was retiring, and his younger brother was named president in February 2008. Early on, Raul Castro called for improving efficiency, cutting government bureaucracy and boosting food production. “We should not be at peace as long as land remains idle,” Castro said. And if land isn’t fit for crops, trees should be planted, he said. Planting trees isn’t all that difficult, he said, joking that “even young people” like himself can do it. “Yes, we can,” he said. Castro’s supporters said they liked what they heard. Blocks away, not everyone was as enthusiastic about Castro’s speech. Efren Oro, 65, a retiree who says he still works to supplement a $10-per-month pension, complained that government officials can’t seem to fix the economy. A man named Lazaro, who drives a bicycle taxi, complained that he has to work 14 or 15 hours a day to feed himself and his family. Asked for his last name, the man replied, “That which I don’t have. What I don’t have is peace,” he said. “My name is de la Paz.“ Paz means peace in Spanish. Another Holguin resident, Fermin Camejo, 38, said he’s optimistic about the future. Cuba isn’t as developed as some other nations, but has become a powerhouse in “culture, health and sports,” he said. “We want to live in brotherhood, not war. We don’t want to fight with anyone,” he said. 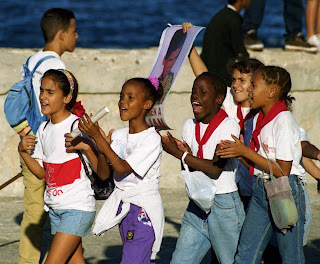 Today is the 56th anniversary of the start of the Cuban revolution. Raul Castro is scheduled to speak at 7 a.m. in Holguin, the same town where Fidel Castro made his last public appearance three years ago. Journalists covering Raul Castro's speech are staying at the recently renovated Hotel Pernik. 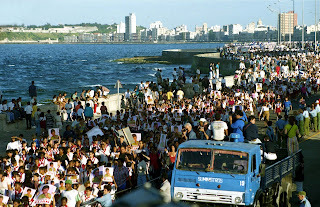 I arrived Friday night after a 10-hour journey from Havana. Frank, a Cuban friend I've known for years, drove the rental car. We got a late start from Tarara, east of Havana, because the rental car company employees didn't show up on time for work. One worker dripping with sweat finally came walking to the rental car agency and opened the place for business. Not long after we reached Holguin, Frank discovered a spot selling big bottles of beer for a little over a dollar. That made his day. 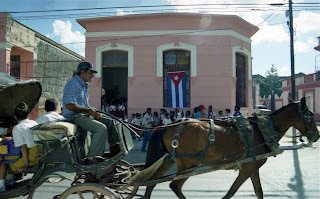 On Saturday, the Cuban government organized a trip to Biran, the birthplace of the Castro brothers. The brothers' father, Angel, was a landowner. We toured the company town he built. A guide showed us a little bar that he said Raul Castro used to run. Raul - not Fidel - was in charge of the bar, the guide said, because he was the better barman. Next to Raul's bar was a room where the Castro boys played billiards. I asked who was the better player. Raul was better at that, too, the guide said. Fidel Castro evidently had other things on his mind. I'll post pictures later on. Right now I've got to take my photo and other gear to a security inspection that starts at 5 a.m. 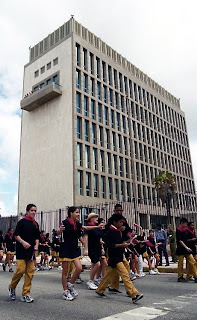 The Office of Foreign Assets Control, or OFAC, today updated its list of air, travel and remittances providers to Cuba, and it looks to me like there are about two dozen new providers. A lot of these providers are likely getting into the business to take advantage of the Obama Administration's loosening of travel restrictions for Cuban-Americans. 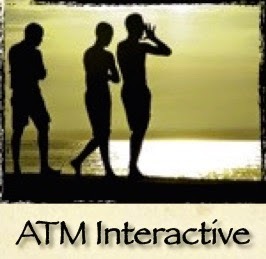 The 24-page list includes the names and contact information for all the Cuba travel providers. 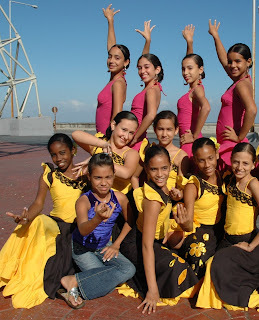 I came across some dancers along the Malecón and asked to take their picture. They were happy to oblige and had a big debate among themselves about how to pose. They were particularly concerned with figuring out the best way to hold their hands. You can see they are trying all kinds of different techniques. This is the pose they settled on. Some held their hands high. Others flashed signs. And others hid their hands from view, always a safe choice. 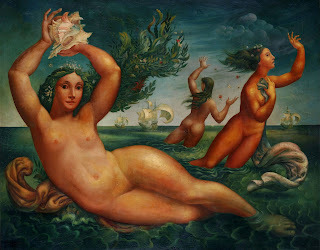 Christie’s in New York auctioned off a Cuban painting for US $2.18 million, Havana Times reports. 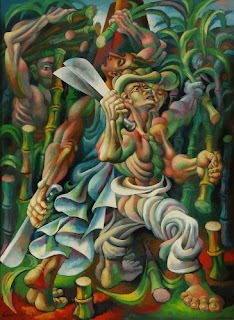 Mario Carreño's painting is called Fuego en el batey, or Fire in the sugar mill village. It's a beautiful, dramatic piece. 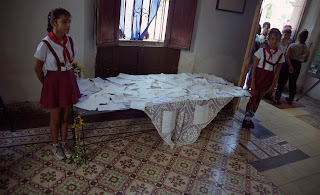 The painter died a decade ago in Chile, said the Havana Times, which calls Fuego en el batey "probably the highest price paid in history for a piece by a Cuban artist." I would have figured that a Cuban painting at some point in history sold for more than that, but a quick Google search didn't turn up any. The Havana Times story says some officials in Cuba considered the painter to be a gusano, or worm, as counterrevolutionaries are called and his work wasn't promoted on the island. 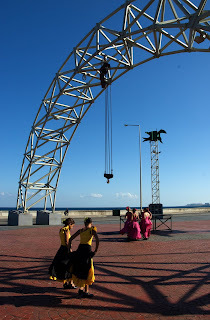 The artist produced several public murals, including one at the Habana Libre Hotel, which "was regrettably removed" and is "missing," Havana Times said. 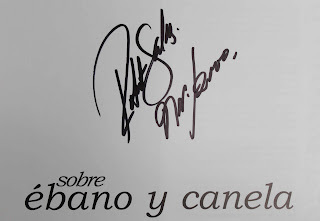 I wrote about Roberto Salas in a post yesterday. A reader asked if the book was signed. Her father was an actor and her mother, a make-up artist. It was only natural that Ikay Romay seek out the spotlight. Her background is fascinating, starting with how she came into the world. When her mother was pregnant with Ikay, she couldn't make it to the hospital on time. So Ikay was born in a van. Curiously, the van belonged to the Instituto Cubano de Artes e Industrias Cinematográficas, or ICAIC by its Spanish initials. Her parents thought it would be fitting to name her ICAIC. Tthey came up with a variation, Ikay, which is a little easier to understand and spell than ICAIC. 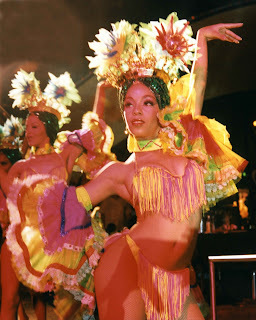 An early '90s magazine Q&A with Ikay, who appeared in the movie La Habanera and was part of the famed Tropicana dance troupe. In the Q&A, the interviewer asked if she was satisfied with Cuba's socialist government. 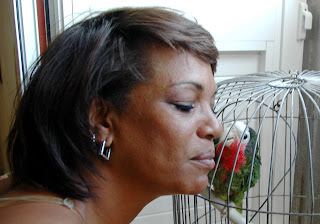 She said she believes Cubans are free because they have dignity and "a sense of independence." And, she said, they have the satisfaction of knowing they haven't surrendered to anyone from another country. 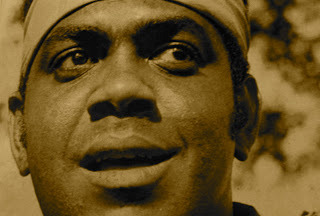 Cuban actor Eric Ikay died when his daughter, Ikay, was just 15. Ikay's husband is also in the entertainment industry. Here, he has a fashion model in his viewfinder. 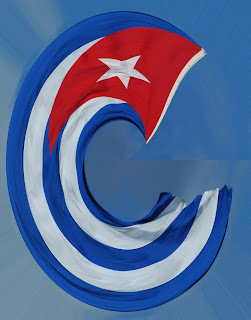 The name for ICAIC in English is the Cuban Institute of Cinematographic Arts and Industry. Its founders include Silvio Rodríguez, Pablo Milanés, Noel Nicola and Sara González, among others, Wikipedia says. 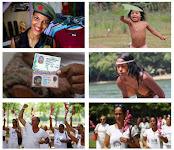 ICAIC's main event is the International Festival of New Latin America Cinema. A vintage Buick spotted near a hilltop cafeteria east of Havana. News alert: "Oh là là...the charms of a nice bottom!" 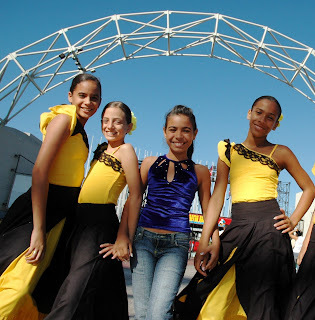 Brazilians like Barack Obama - and he seems to like them back in this photo, which I spotted on the Babalu blog. French President Nicolas Sarkozy didn't even try to be subtle. 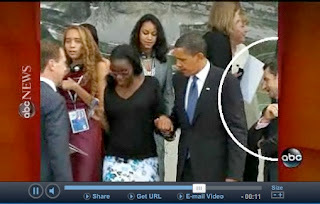 Watch the ABC video here to decide if Obama is checking his footing, trying to be a gentleman as he helps the woman in the black blouse, or scoping out the 16-year-old Brazilian teen named Mayora Tavares. Oh là là - US President snapped checking out delegate's bum! He may be the world’s most powerful man but even Barack Obama is not immune to the charms of a nice bottom! Evidence of Brazilian affection for Obama: This nearly naked carnival dancer, Viviane Castro, put a likeness of the president on her thigh. Ant sent along this photo, further confirmation of Sarkozy's wandering eyes. 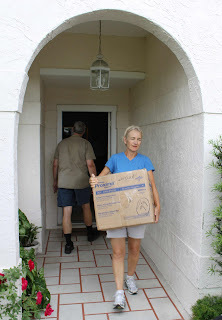 "One of the reasons Mummy won't let him be king"
Volunteers in Palm Coast, a town 37 miles north of Daytona Beach, worked Thursday to finish packing and loading a shipment of humanitarian aid that is bound for Cuba. 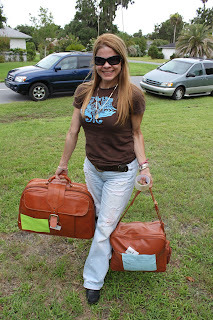 The volunteers loaded the boxes, suitcases and duffel bags into a trailer and onto two trucks that will join the Pastors for Peace Friendshipment Caravan. More than 130 caravan participants along 14 routes in 47 states and six Canadian provinces plan to converge on the U.S.-Mexico border by July 21. They'll have more than 100 tons of humanitarian aid with them and they'll attempt to cross into Mexico in defiance of the U.S. ban on trade with Cuba. From there, they'll travel to the Mexican port of Tampico, where the aid will be loaded onto a Cuba-bound freighter. Under American law, it's illegal to ship goods to Cuba without U.S. government licenses. Caravan organizers refuse to apply for licenses as an act of civil disobedience. 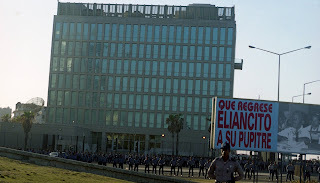 They are protesting the longtime U.S. economic sanctions against Cuba. 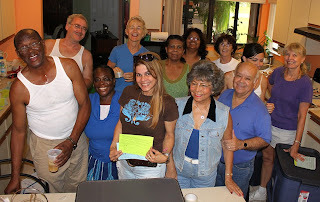 The caravan is a project of the IFCO, or Interreligious Foundation for Community Organization. 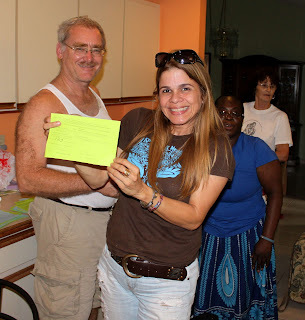 Over the past 20 years, IFCO volunteers have delivered more than 3,000 tons of aid to Cuba without the required U.S. licenses. We must continue to keep the pressure on - to end the blockade, to normalize relations with Cuba, and to engage in dialogue based in mutual respect, rather than our insisting on undermining Cuba’s sovereignty. President Obama has taken a small first step to change US/Cuba policy. But as people of faith and conscience, it is important that we make our voices heard in favor of even stronger measures for reconciliation and normalized relations. Pastors for Peace rejects the current licensing system as both immoral and illegal. 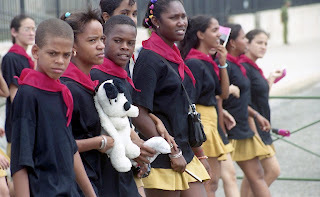 It is immoral because it endangers the lives of millions of Cubans and inflicts suffering on innocent children, as well as adults. It is illegal under international law because it uses medicine and food as weapons of war to force another nation to change its government. Licensing is also unconstitutional because it requires people of faith to submit their acts of conscience and friendship to government licensing, in violation of our right to freedom of religious expression, political thought, association and travel. 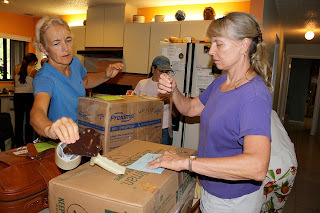 Diana Starke, left, and Nana Royer, right, both of St. Augustine, help pack the humanitarian aid bound for Cuba. The humanitarian aid collected throughout the U.S. includes "school buses, construction tools and materials, educational supplies, medicines, and medical supplies gathered in communities throughout the U.S. and Canada," Pastors for Peace said. The Florida trucks will pass through Mobile, Ala., New Orleans and Houston before reaching the U.S.-Mexico border at McAllen, Texas. The Miami Herald Publishing Co. and the Associated Press are trying to force federal prosecutors to release "unclassified but sensitive" material in the federal government's case against Luis Posada Carriles. Prosecutors want the U.S. District Court in El Paso to "enter a broad protective order that would violate the Constitution," the news organizations contend in a motion filed June 30. Prosecutors requested the protective order in a June 5 motion. Such an order would give the government a "blanket license to preemptively cause certain unclassified documents to be filed under seal, without prior review," the news organizations say. ...the Government has simply sought to limit the dissemination of information that does not qualify as judicial records but is sensitive to legitimate privacy, commercial, national security, law enforcement, and foreign government interests. Thus the proposed protective order cannot be equated to a global gag order. ...having mischaracterized the common law, misstated the case law, and misrepresented the facts, third party media outlets’ Motion to Intervene should be denied; and the Government’s proposed protective order should be entered. In a June 30 reply, the government says Posada Carriles' lawyer "misconstrues the terms of the Government's proposed Protective Order for Unclassified But Sensitive Material...and quibbles with its wording, after having declined to discuss the terms of a mutually acceptable order." Finally, and most importantly for this Court, good cause exists for the entry of a protective order to limit the inappropriate use of sensitive material in which there is a privacy, proprietary, or ongoing criminal investigative interest. We'll see how Judge Kathleen Cardone responds. Many judges have a tendency to side with government officials in such cases. We'd like to trust federal authorities when they tell us that information cannot be released because it might jeopardize an ongoing investigation or threaten our national security. The problem is, we can't always trust Uncle Sam. 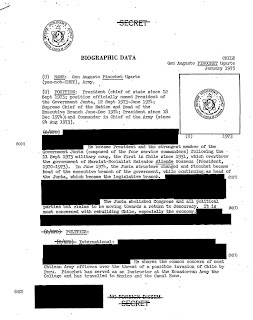 Secrecy during the Bush administration rose. 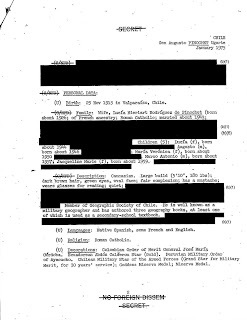 Millions of previously declassified documents were reclassified as secret, according to the National Security Archive at Georgetown University. And not all the secrecy was necessary. 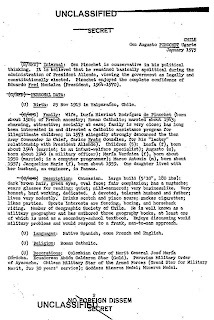 Example: A two-page biographical sketch of Chilean military dictator Augusto Pinochet. There are two versions - one declassified in 1999 and one reclassified four years later and included among 14 million documents kept secret in 2003. 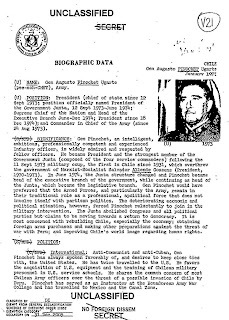 In a May 2004 post, the National Security Archive said the Defense Intelligence Agency "blacked out large sections" of the 1999 biographical sketch "on ostensible national security grounds, including General Pinochet's liquor choices - scotch and pisco sours..."
Pinochet's pisco sours are certainly not the only dubious secret among the 14 million new ones. The real question is whether the secrecy veil really makes us safer, or does it hide our country's vulnerabilities and policy problems when what we need to do is fix them? No doubt, it's easier for federal authorities to keep information secret rather than deal with the consequences of its release. But that does little to keep or win the public's trust. Barack Obama has vowed greater transparency in government. We'll know over time if he fulfills that promise. In the Posada Carriles case, it's obvious prosecutors are fighting hard to prevent the release of material. I wonder why. As a journalist, I've dealt with many U.S. officials over the years. There are many officials I respect and trust on a personal level. But I don't think it's ever a good idea to blindly trust any government. Judge Cardone has a duty to make sure that the federal government justifies its need for secrecy. Posada Carriles is a former CIA operative who has been linked to bombings and assassination plots. As much information as possible should be disclosed in his case. That would be in the public's best interest, not hiding documents from public view, even if that material might prove embarrassing to the government. 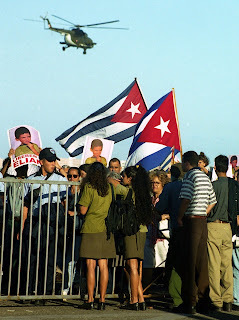 It's been just over nine years since shipwreck victim Elián González was returned to Cuba to live with his father, Juan Miguel González, on June 28, 2000, after a hard-fought international custody battle. I've often wondered how Elián is doing. 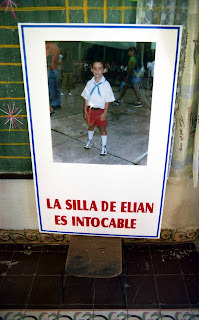 I spoke his father once, but could never get an interview with Elián, who will be 16 in December. 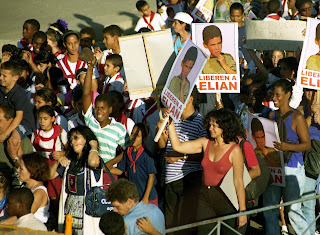 The pro-Elián marches in Havana and other cities were quite a spectacle. 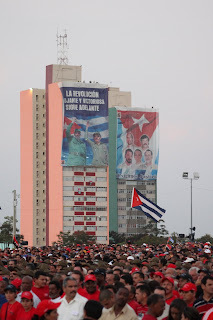 Here are photos from a rally in Havana and an event in Cárdenas, Elián's hometown. 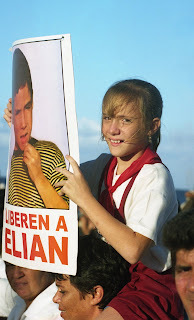 Elián's mother and 11 other people died in the voyage across the Florida Straits in November 1999. Her name was Elizabet Brotons. She and the boy's father combined their names to come up with Elián's name. Eli - from Elizabet + an - from Juan = Elián.